Divorce can be a stressful event, no matter how long you have been married. Add children to the mix and things get even more emotional. If you have a special needs child, things tend to get even more complicated. This is something to think about it, considering that as many as 90 percent of couples with a special needs child end up divorcing. If you have a child with a disability and plan to divorce, you’ll need to do a bit more planning. That’s because custody and support issues for a special needs child likely will not end once the child reaches adulthood. Parents need to have long-term care goals in mind for a child when they divorce. Even children with seemingly minor disabilities may need a lifetime of care. When making decisions about your child, understand his or her unique needs. There won’t be a one-size-fits-all approach, as each child is different. For example, some children have difficulty adjusting to multiple homes, so one parent may have to have sole custody in these cases. One parent may not work outside of the home and therefore would be better suited to caring for the child full time. It is important to think about the best interests of the child, as any undue stress during the divorce can be harmful. In terms of child support, parents need to consider short-term and long-term expenses to cover the child’s care. What is the child’s prognosis? How much care will the child need? Does the child need special medication or therapies? Remember, the cost of caring for a special needs child will likely be much more than the cost of caring for a non-disabled child. Once your child turns 18, you may need to continue providing care. To help with financial decisions, a child can execute a General Durable Power of Attorney to allow one or both parents to make decisions. A Health Care Proxy can assist with health care decisions. 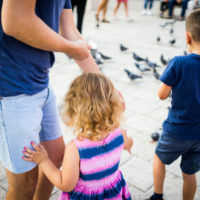 Guardianship by either parent is also a possibility in situations where a child is age 18 or older, incapacitated and unable to make decisions on his or her own. Co-guardianship may be a good idea if the parents can behave in an amicable manner. However, many choose to have one guardian, with the non-guardian parent still playing an active role in the child’s life. Divorces are stressful for all involved. What parents sometimes don’t think about is how ending a marriage will affect a child, especially one who is disabled or has special needs. The best interests of the child still need to be taken into consideration. If you are going through a divorce and have a child with special needs, proper planning is essential. The Dade City divorce attorneys at Mander Law Group care about your family and your unique situation. We can advise you of the options available to ensure your child receives the best medical care possible, even after a divorce. Schedule a consultation today by calling our office at (800) 557-0411.